Yes, it's flimsy. It will probably break the first time I use it. Then why buy it? Well, you need to understand... when I was growing up there were three types of pencil sharpeners. There was the teeny, hand-held, single hole sharpener which MAY have been metal but was usually plastic; there was the slightly-less-teeny, hand-held, double hole sharpener which, again, may have been metal (if you were posh) but was usually plastic. And THEN... there was the fancy sharpener with the little barrel to hold the shavings. 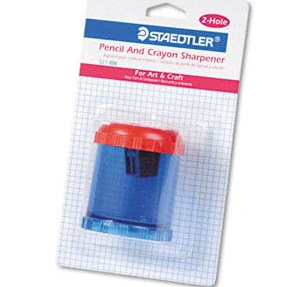 Only the coolest, up-to-the-minute kids had this type of sharpener. Don't believe me? Listen, when I went to Sandra ... somebody-or-other's.... birthday party in Year 3 and we played Pass The Parcel, the prize at the end (after a good ten minutes of playing) was a barrel sharpener - and those of us who didn't win were actually jealous! But now... the barrel sharpener is mine.